What do you do when the kids go to grandma’s? You plan a kid-free getaway to the beach! Florida is famous for its beautiful beaches and Clearwater Beach is no exception. While there, you’ll need to eat and you’ll discover plenty of fantastic places to choose from. 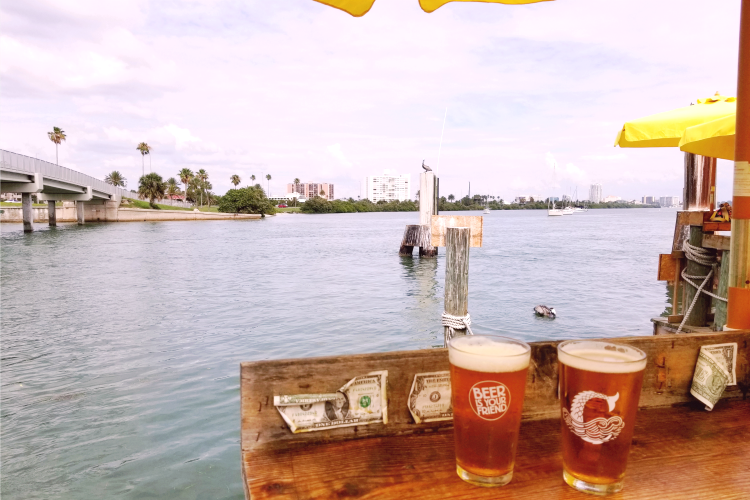 From shrimp and beer at an old bait house to fine dining with white tablecloths, these are some of the best places to eat in Clearwater, Florida. When my girls went to visit my parents recently, my husband and I wanted to take full advantage of it. Since we rarely get alone time, we thought it would be fun to plan a couple of short getaways. The first of these getaways was to one of my favorite beaches in Florida, Clearwater Beach. With its beautiful white sand, amazing hotels and a multitude of activities it’s the perfect vacation spot for either a romantic kid-free getaway or a fun family vacation. Part of the fun of going on vacation is finding great places to eat. 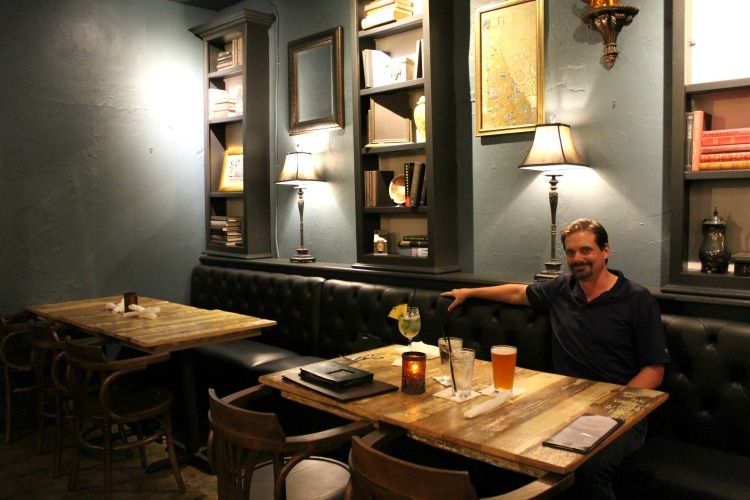 When we were choosing where to eat in Clearwater, Florida, we went with a mix of the old and the new. We had a couple favorites from a previous trip and checked out a few new restaurants as well. When we visited Clearwater Beach four years ago, we had breakfast at the Clear Sky Beachside Cafe. We had a nice breakfast but what I really remembered was the Bloody Mary bar. My husband loves a good Bloody Mary and was in heaven. 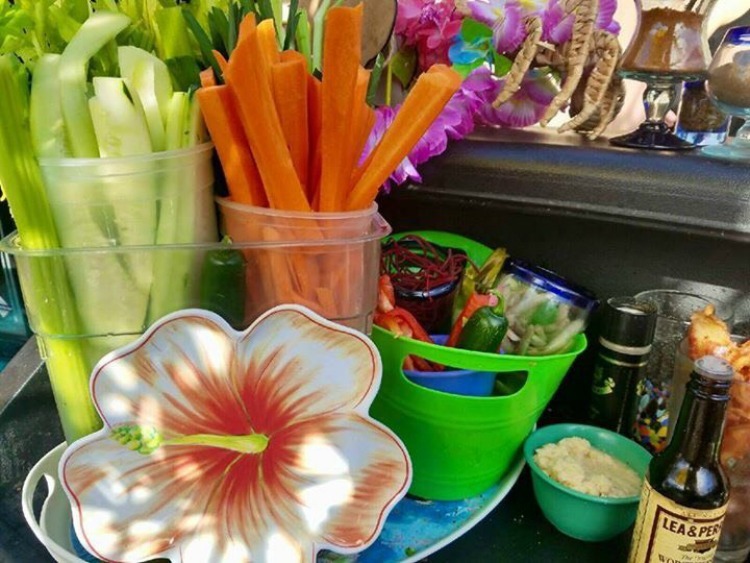 He was able to choose from a multitude of garnishes and loaded his drink with shrimp, cheese, peppers and everything else he could squeeze in. Since the Bloody Mary bar only opens on weekends, we missed it this time but still had a great breakfast. I was looking for something healthy so I ordered the vegetarian egg white omelet. I’d never had an omelet stuffed with green beans but it totally worked for me because I happen to love green beans! Jon is a seafood lover so he chose the Coast Watch, a seafood omelet with crab, shrimp, scallops and more. Seafood for breakfast? He was pretty happy! If you really want to indulge, the couple next to us ordered an amazing looking french toast dish generously topped with berries. Though I was happy with my healthy omelet, next time I might just have to try what they were having! 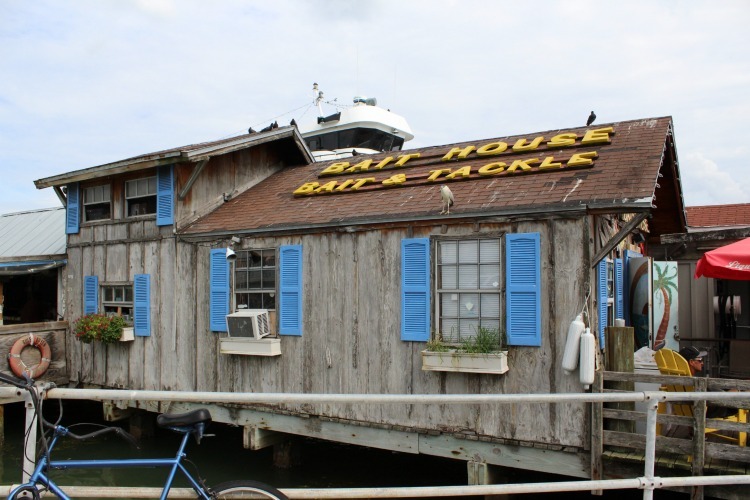 The Bait House is another place we discovered on our previous trip and couldn’t wait to visit again! Don’t expect anything fancy…it’s an old bait house/shack at the end of a pier that definitely looks like it’s been there awhile. However, that’s the charm of it and why we love it so much…it just feels like “old” Florida. 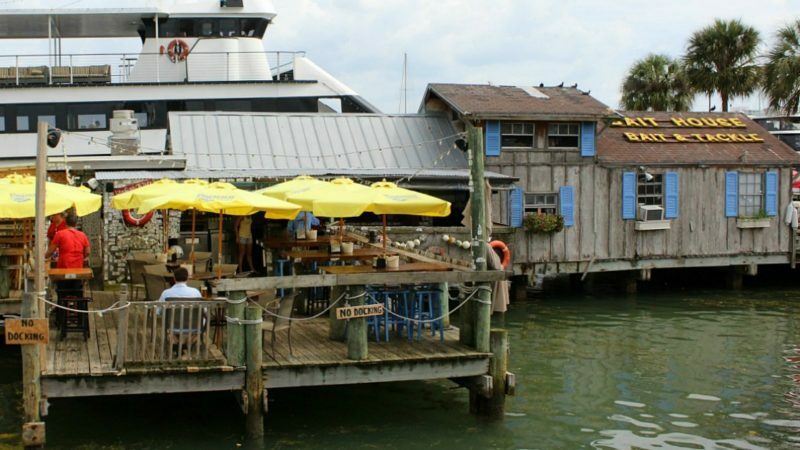 This is the perfect place to go when you’re in the mood for some cold beer and hot shrimp. They actually offer a full menu with seafood, tacos, sandwiches and more but their boiled shrimp is so good, we’ve never actually ordered anything else. This is just a great place to sit back, relax and enjoy the view. TravelingMom Tip: If you or anyone in your family enjoys fishing, The Bait House will prepare your catch for you. When I asked my Sarasota friends where we should have lunch while in Clearwater, so many people suggested Frenchy’s that I couldn’t NOT go there! There are four Frenchy’s restaurants in Clearwater so we chose Frenchy’s South Beach because it was closest to our hotel. Located just across from the beach, there is a large patio as well as inside dining. 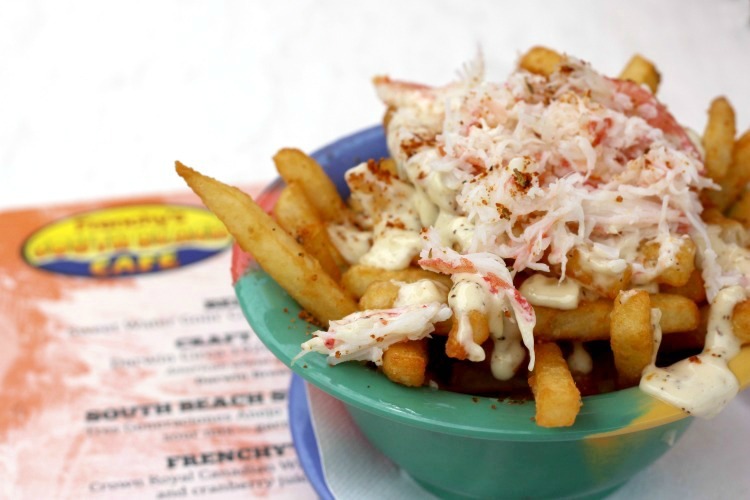 Famous for their crab fries, we couldn’t visit Frenchy’s without giving them a try. Beer battered fries are tossed in garlic butter and parsley, then topped with garlic aioli, Old Bay seasoning and snow crab. They really were good and we could see why even Alton Brown has raved about them. 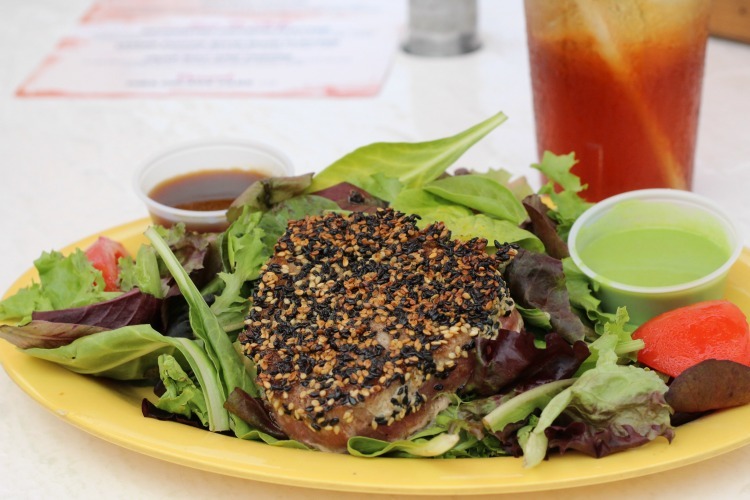 For lunch, I ordered the Sesame Tuna Salad, seared tuna encrusted with sesame seeds and served over fresh greens with sesame dressing and a soy ginger sauce. The tuna tasted great with the sesame crust and the dressings were the perfect complement. No Florida vacation is complete without a grouper sandwich so Jon ordered the Super Grouper. It’s just like their traditional grouper sandwich, only bigger. He finished the entire thing so it must have been good! You can also order tacos, platters, and baskets with chicken or a variety of seafood. Feel free to bring the kids along. The children’s menu at Frenchy’s has all the traditional kid favorites such as grilled cheese, cheeseburgers, and chicken fingers. 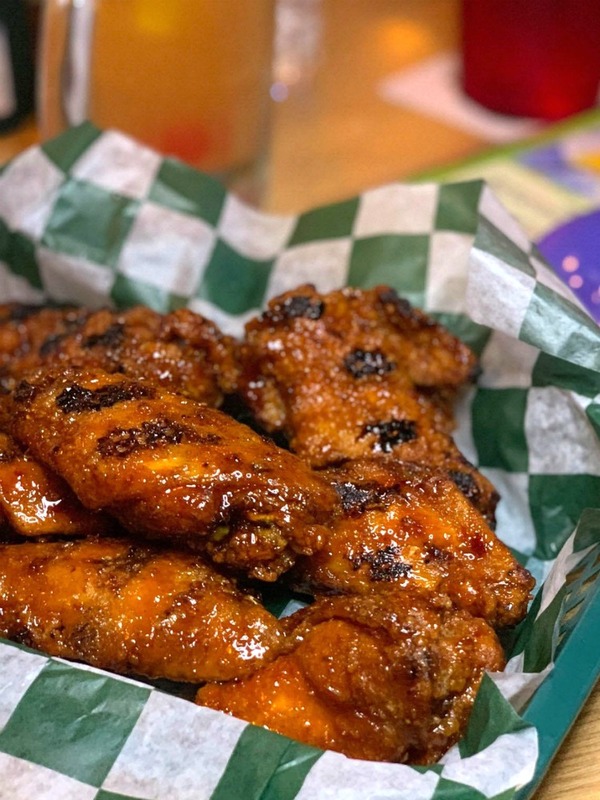 It may be tempting to stick near the beach but then you’d miss out on dining at one of Clearwater’s newest restaurants, Clear Sky On Cleveland. You’ll find it in the trendy downtown section of Clearwater, which is growing into a great little spot to hang out. Walk in the front door and it looks just like any other restaurant. However, you’ll want to request a table in the Garden Room. We absolutely loved the look of this dining room and really felt as if we were dining in a garden courtyard. There were plenty of dishes to choose from on the brunch/lunch menu. 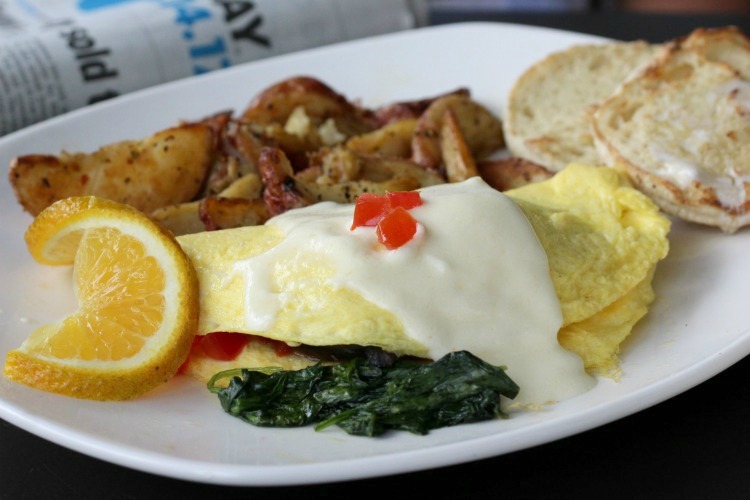 You could order anything from omelets and pancakes to sandwiches and salads. The crepes with fresh berries were almost too pretty to eat! I thought about ordering them until I saw the Brie BLT. 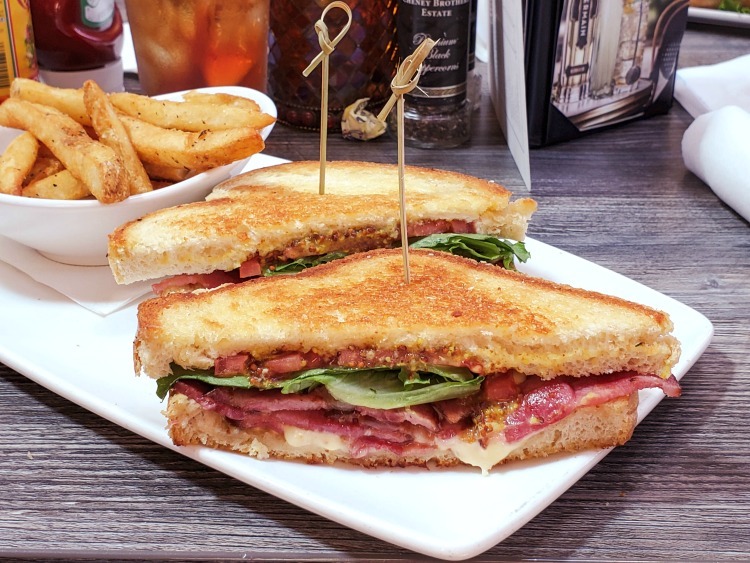 Made with applewood smoked pork shoulder bacon, brie, lettuce, tomato and sourdough bread, it was every bit as good as it sounds! 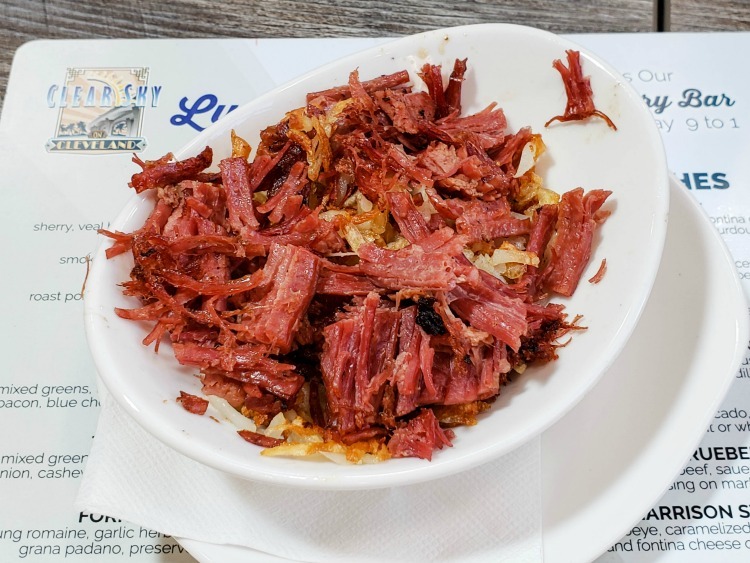 We had to try the corn beef and hash since it’s one of the specialties. I’d never had it before but this was delicious and those in the know said that it was some of the best they’d had. 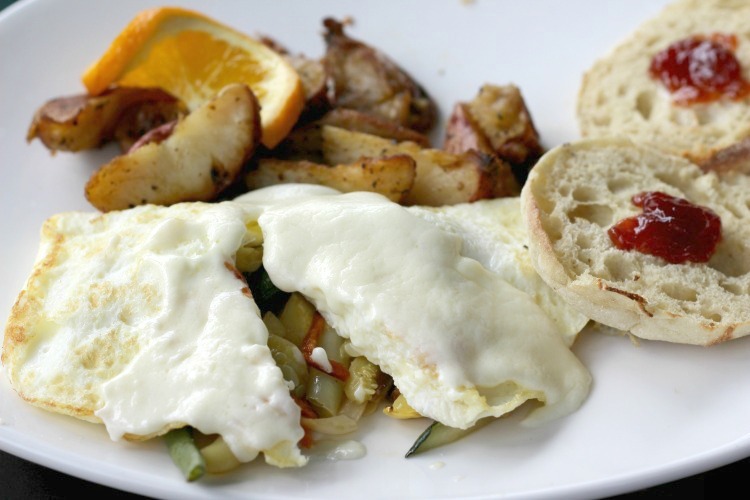 We shared the side dish but you can also order a skillet with extra ingredients such as veggies or eggs. 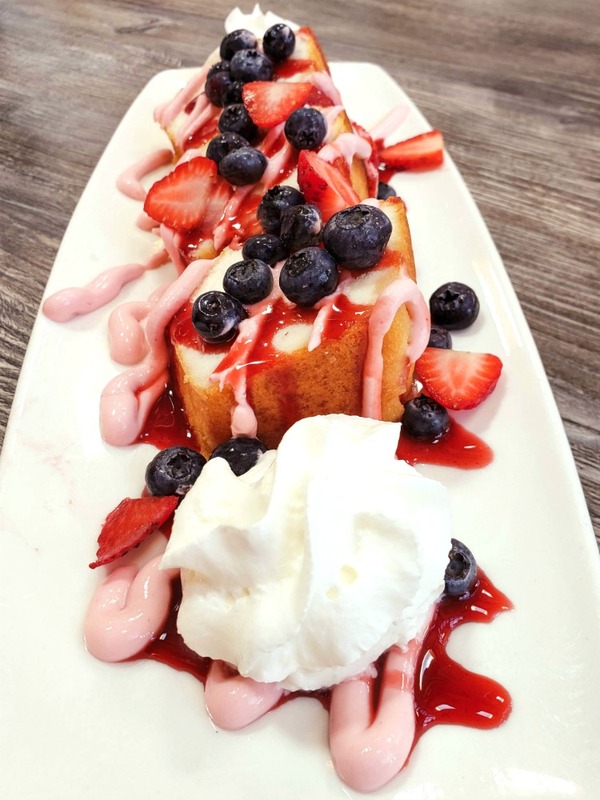 If you still have room for dessert, you should give the cake with fresh berries a try. After one bite, we were hooked and there was nothing left when we were finished! TravelingMom Tip: If you don’t have a car, or just don’t feel like driving, the Clearwater Jolley Trolley stops right in front of the restaurant. It’s a fun ride that only costs $2.50 a ride or $5.00 to hop on and off for an entire day. Want a restaurant that really has that down-home Florida feel? 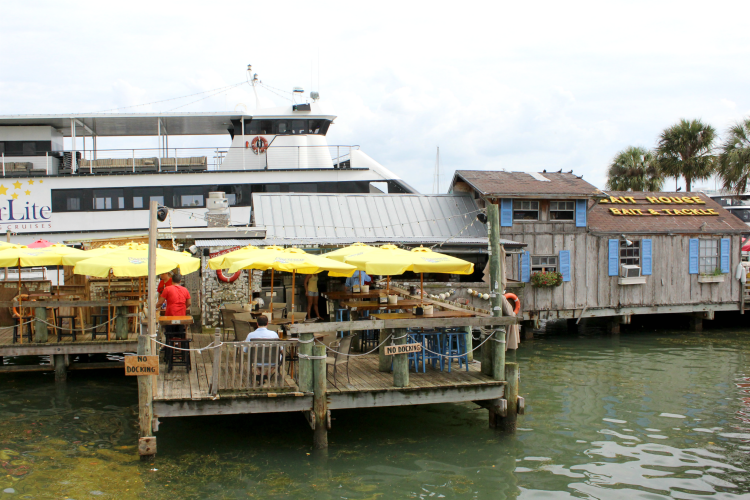 Cooters Restaurant and Bar is a regular stop for us when we head to Clearwater. It’s the kind of place where you can’t help but have a good time! Show up in shorts and a t-shirt and you’re good to go! Of course, nothing says Florida like seafood and the specialty here is crab, crab and more crab. We started with the crab stuffed mushrooms. 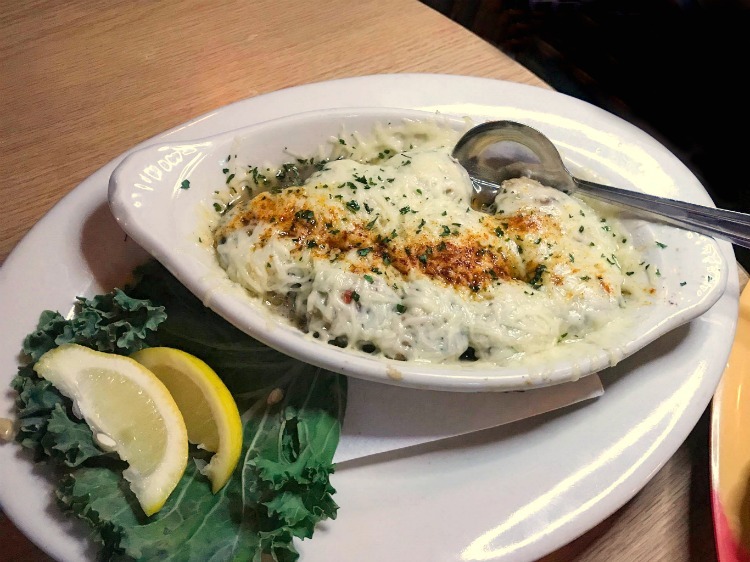 Filled with crab meat and covered in melted cheese, these were a big hit at our table. I’m not usually into chicken wings but theirs were really good! You can order them the traditional way or try something different and get Tequila or Honey BBQ. You may just want to go straight for the crab legs. 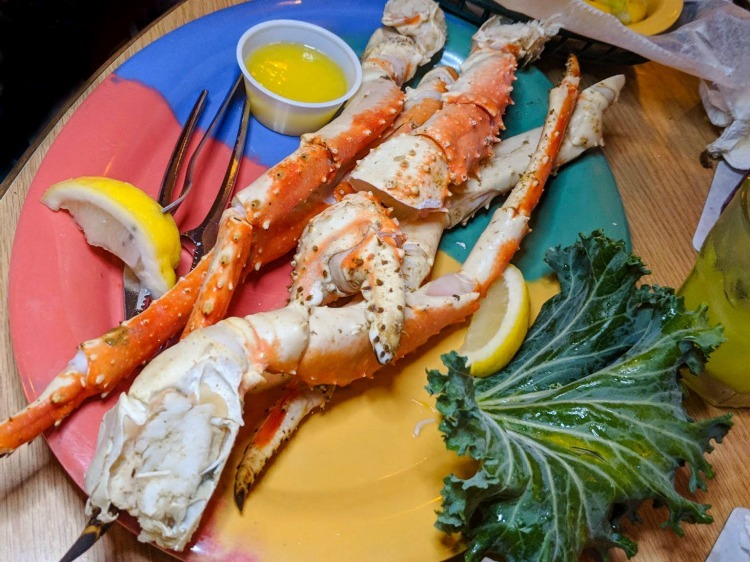 They’ve been voted “Best Crab In Tampa Bay” and after one bite, you’ll understand why. If you’re not into seafood, there are plenty of other choices on the menu, including ribs, steak and chicken. 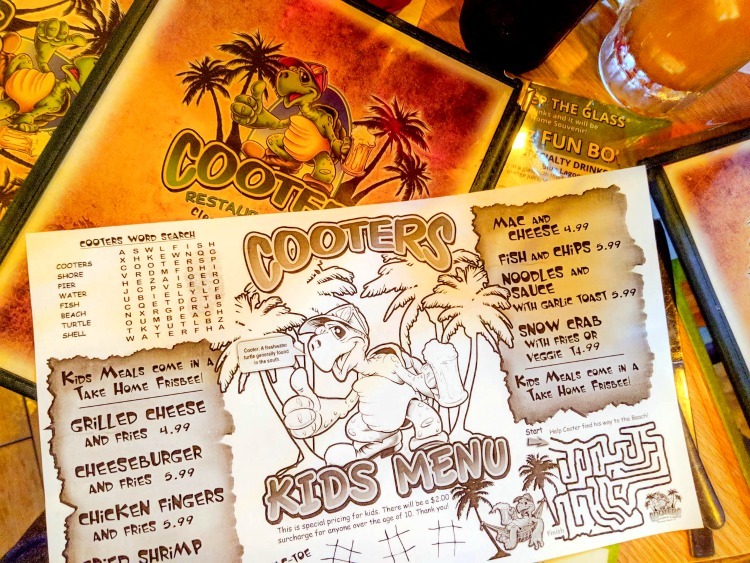 Cooters Restaurant is not only fun for the grown-ups but it’s family friendly too. 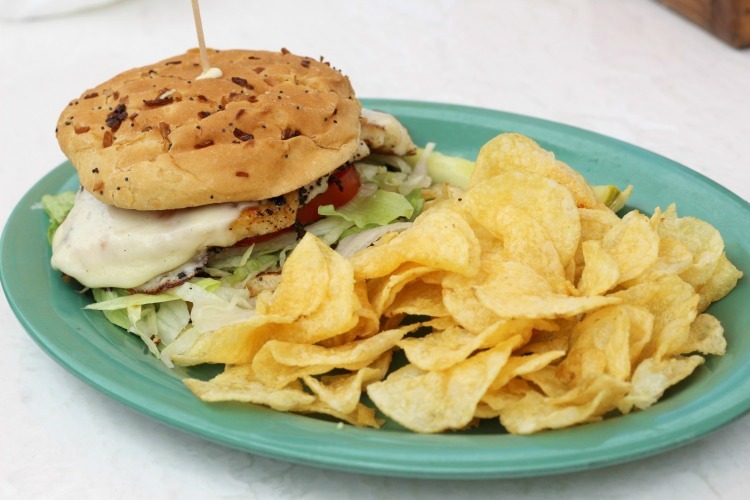 The kid’s menu includes traditional favorites like grilled cheese and chicken fingers. However, more adventurous kids might want to try the Fish and Chips or Snow Crab. As an added bonus, kids meals come in a frisbee, which they can use on the beach the next day. Cooters is in a great location and walking distance from Pier 60 and many of the hotels in the area. 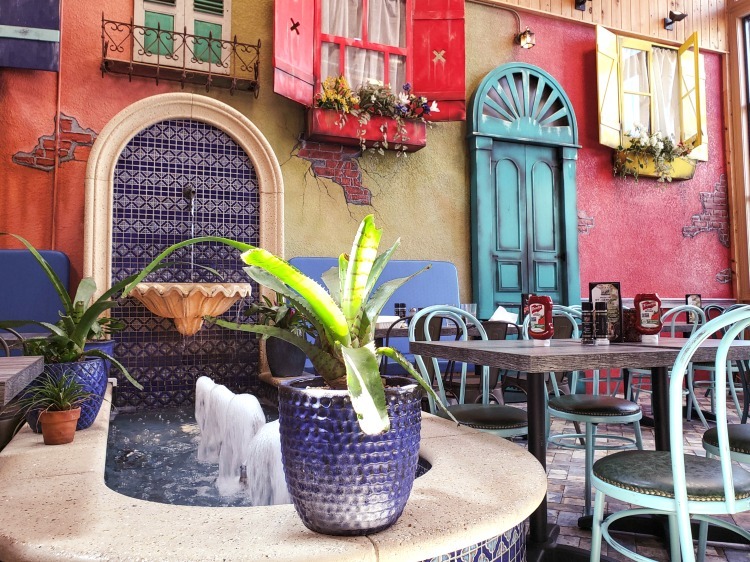 It’s a perfect choice if you’re looking for a casual place with great food and a fun atmosphere. 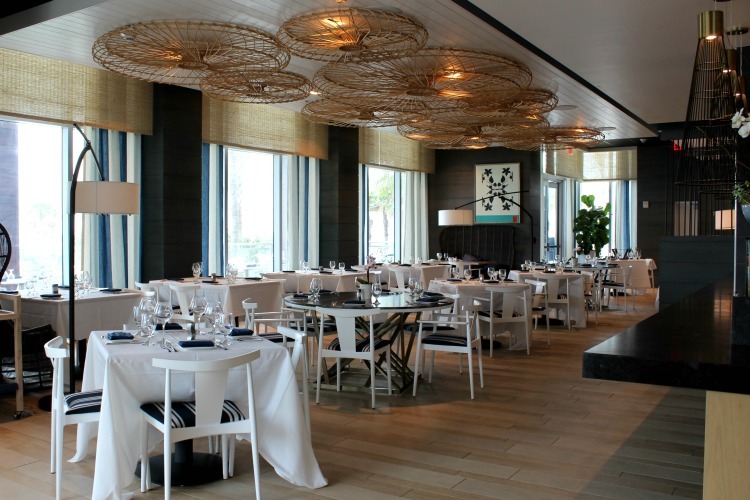 If you’re in the mood for fine dining, you’ll want to try the new Ocean Hai restaurant in the Wyndham Grand Clearwater Beach. Overlooking the ocean, I’d recommend making a reservation just before sunset for the best views. Our waitress Christine knew the menu inside and out so I asked her for a drink recommendation. 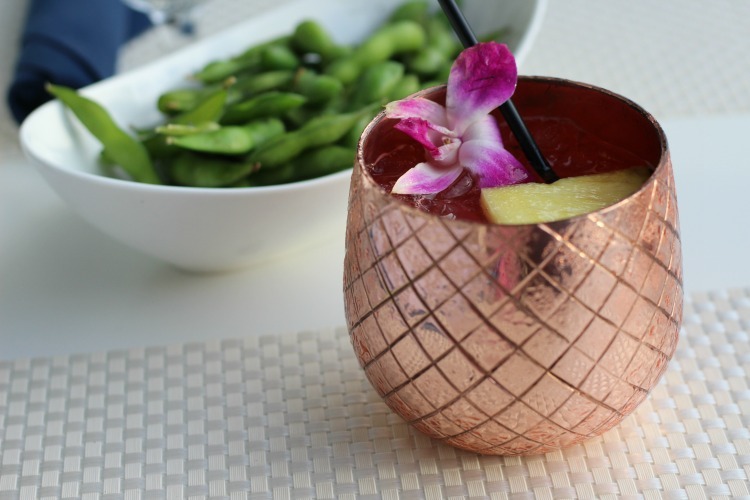 She recommended this Maui Mule, a twist on the traditional Moscow Mule. Served in a pineapple-shaped copper mug, it was as delicious as it was pretty. Since Christine had done so well with the drink recommendations, I decided to go with her suggestions for the rest of the night. For our appetizer, we had the Tiger Roll, with spicy salmon, shrimp, and asparagus. 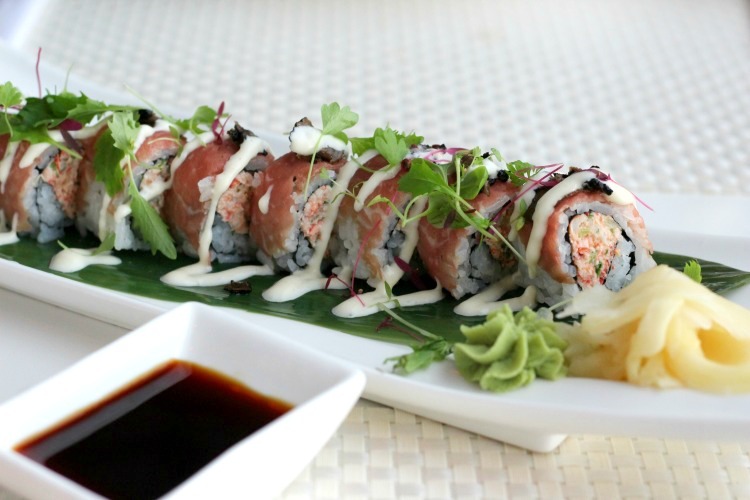 It was easy to see why this was one of their most popular appetizers and if you like sushi, you’re going to love this. 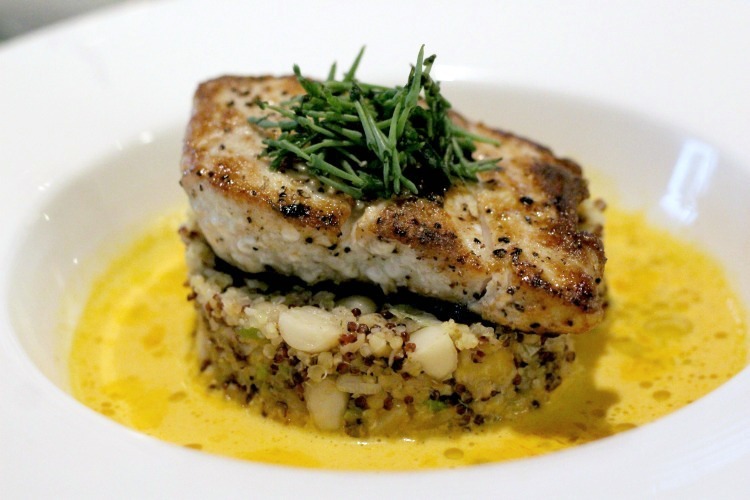 Dinner was a delicious Mahi-Mahi dish served over whole grains with macadamia, charred pineapple and lobster nage (basically a fancy name for lobster sauce). My husband Jon had the lamb, which he said was excellent. We were almost too full for dessert but when Christine suggested the Lemongrass Creme Brulee, I couldn’t resist…it’s one of my favorite desserts! Like the cocktail, It was almost too pretty to touch but that didn’t stop us. The top didn’t have the hard shell that you find on traditional creme brulee, but it was creamy and sweet and we finished the entire thing! We really enjoyed our dinner at Ocean Hai. The service was great, the food was delicious and the view couldn’t be beat. 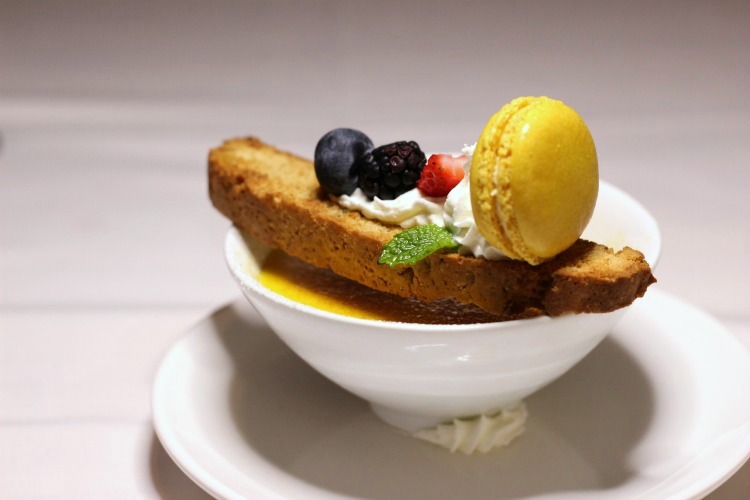 Dinner here can be pricey, but it’s worth it if you feel like treating yourself. TravelingMom Tip: While older children may be fine here, I wouldn’t recommend it for younger children. While in Clearwater, we visited Dunedin, a cute little town just a few miles north. It’s an area with lots of shops and restaurants, a fun place to explore when you feel like taking a break from the beach. As I was planning our trip, I checked out a few restaurants that had been highly recommended and The Living Room On Main caught my eye. Eclectically decorated to resemble a living room, this place also features live music every night and sounded like a perfect place for our next date night. The first thing I noticed when we walked in is that it really does look like someone’s living room. There are fun lighting fixtures, books, and other knick-knacks and decor that you might find on your grandma’s bookshelves. It was unlike any restaurant that we’ve been to and Jon looked right at home as we found a cozy table in the corner. 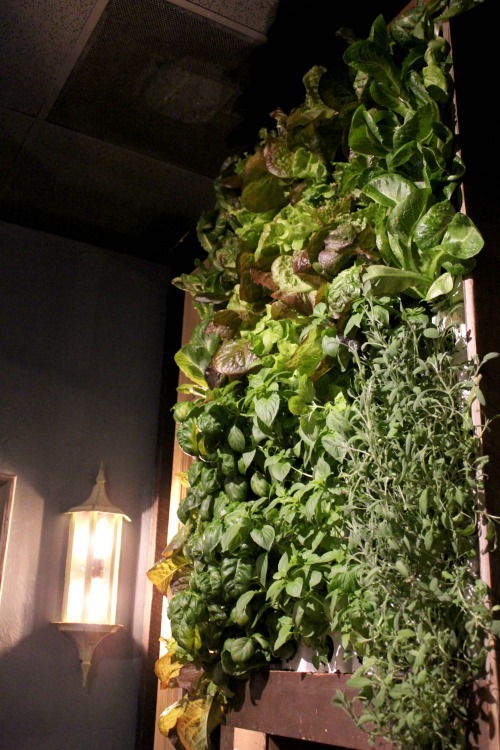 When our waitress came by, she told us a little more about the restaurant and the “living wall.” The living wall is a working garden that they grow right in the dining room. This is where they get the lettuce for salads, garnish for drinks and any other greens that they need for recipes. I found this concept fascinating and now I want one in my house, though I’m sure it wouldn’t last long with my black thumb. I started with a craft cocktail called the Pineapple Express and this is now one of my favorite new cocktails! 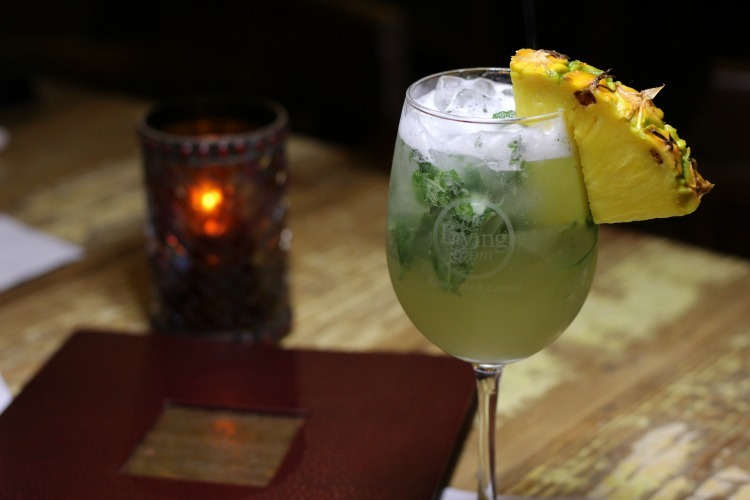 Made with coconut rum, butterscotch liqueur, pineapple juice and muddled pineapple sage (picked from the living wall), it’s a sweet drink and the butterscotch gave it a unique flavor. This was one of the best cocktails I’ve had in a long time, though you have to like sweet drinks to really appreciate it. 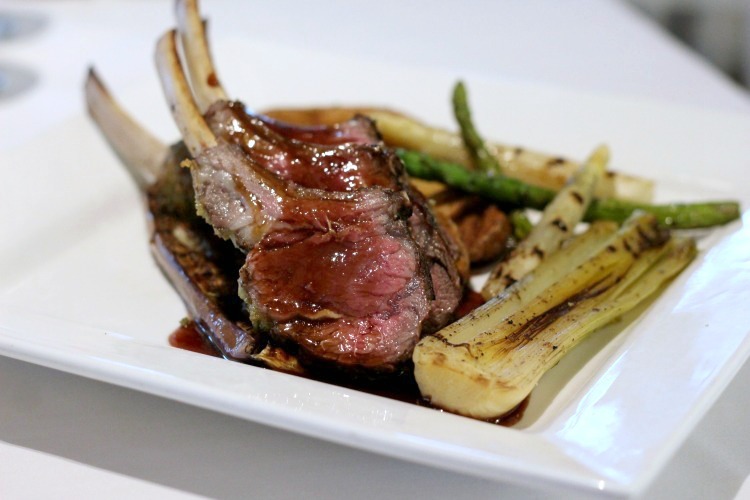 The menu had plenty of selections to choose from, including lamb chops, seafood risotto, stuffed portobello mushroom and more. There are even kid-friendly options such as sliders, chicken drumettes, and feta & spinach meatballs. We started with the “Off The Wall” salad, mainly because I wanted to eat a dish picked straight from the living wall. It doesn’t get much fresher than that! For our meal, we ordered the Steak & Shrimp Brochettes and the Miso & Ginger Grilled Salmon Tacos to share. 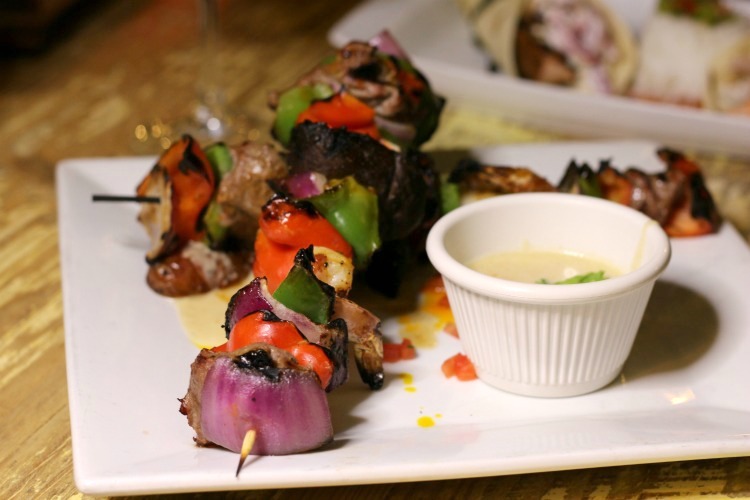 The brochettes are skewers of grilled with Angus beef tenderloin tips, jumbo shrimp, portobello mushrooms, peppers, onions, fingerling potatoes and gorgonzola fondue on the side. The meat was so tender and perfectly seasoned that we didn’t even use the fondue sauce. The salmon tacos were equally as tasty. 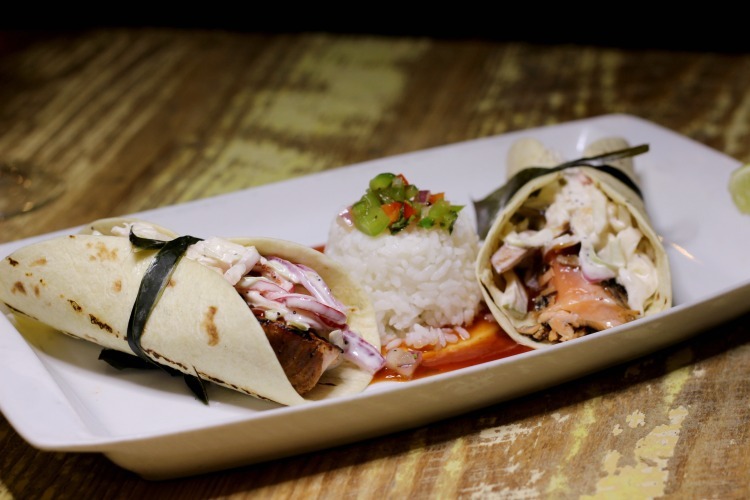 Flour tacos are filled with salmon, Asian pear slaw, pineapple BBQ, ginger sticky rice and jalapeno Pico de gallo. We love food with an Asian flair and this was fantastic. I’ll definitely be ordering this again next time. These are considered “small plates” but the portions were big and it was plenty of food for the two of us. We managed to leave just enough room for dessert and when our waitress described the Mary Margaret Chocolate Marquise Cake, it sounded so decadent that I had to try it! 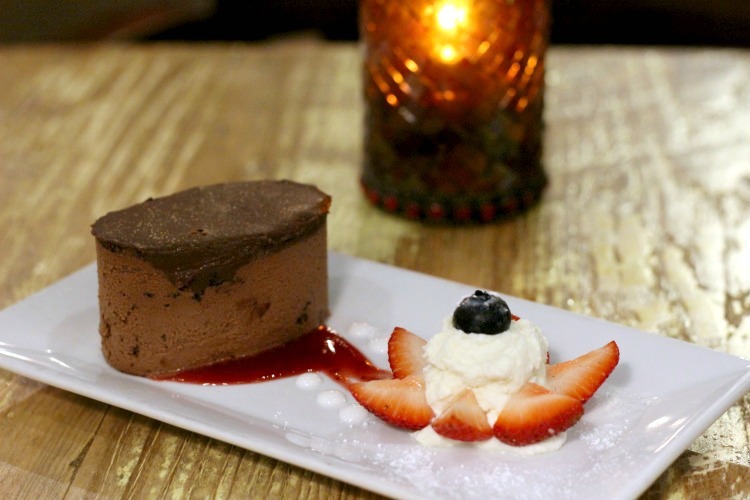 A chocolate mousse cake topped with another layer of chocolate and served over a raspberry sauce, it was just as rich as it sounds…definitely a chocolate lovers dream! The Living Room On Main was perfect for a date night but I could also see us bringing the kids along next time. I think they’d get a kick out of the decor and they’d certainly enjoy the live music. Furry friends are welcome here too and on a nice day, you can bring the dog and enjoy lunch on the patio. Overall, we had an amazing getaway. 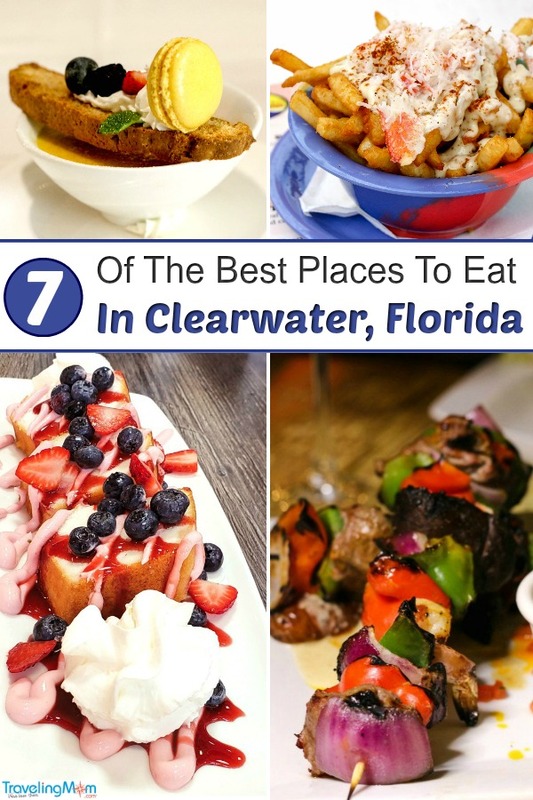 From an old bait house to a restaurant that resembled someone’s living room, we were able to enjoy some of the best places to eat in Clearwater, Florida! Have you eaten at any of these restaurants? Are there more that you would add to this list? 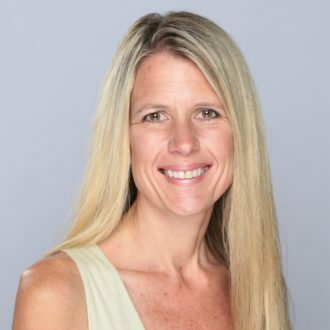 Lisa O’Driscoll is a former kindergarten teacher turned blogger living in Sarasota, Florida with her hubby and two daughters. She’s backpacked several times through Europe (well, she had a carry-on but that doesn’t have quite the same ring to it), studied Portuguese in Brazil, and loves vacationing in the Caribbean. When it comes to travel, she wants to do it all and her ultimate travel dream is to be on The Amazing Race! You’ll find Lisa writing about parenting, food, travel and more at Fun Money Mom. wow—great tips. You’ll treasure memories of some of these places/pretty foods years from now. Great memories of kid-free romantic travel in my house tied to a grouper sandwich place on the water in Sanibel Island FL. We didn’t make it to Sanibel this time but that’s another beautiful location and I love collecting seashells there! Cork & Brew. OMG. Amazing food. Not beach food. Not over-priced food. Friendly staff. Really make you feel welcome. Love the menu. But ask if there are special foods not on the menu. Don’t miss the Tuesday special!!!! !